There’s one reason I track the source of where I obtained a genealogical record: myself. Today I was looking at a digital image I had of a record. Because I sourced it, I knew that I had made the digital image from a copy of the microfilm at the Family History Library. That’s different from a scan I might make of a photocopy I made at the courthouse years ago, different from a scan I made of a paper copy I made from a microfilm printout, and different also from a picture I may take of the actual record. All of these have differing levels of detail from the document. If I don’t know where I got it, it makes it difficult for me to assess years later whether it might be worth getting a copy of the original. When transcribing a document or an item from a document, use brackets to indicate when you are “guessing” at a word or phrase or adding a word or phrase of your own. Personally I add words or phrases rarely, preferring to comment later if something warrants it. The word sic (Latin for “as is”) should be bracketed as well when it is used to indicate that you copied something exactly as it was in the document–even though it looked wrong. There is usually a slight difference between the legal use of the word “heir” and “legatee.” An heir usually is someone who has a biological or legal right to inherit from a deceased person, even if that person leaves no will. A “legatee” is someone mentioned as being given property in a deceased person’s will. 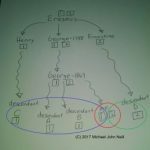 A recent posting on Rootdig covered the nuances in a specific example from 1903. Remember when analyzing sources and the information they contain that just because a majority of sources are consistent does not mean they are correct. They may have had the same “original source” that was simply copied over and over and that “original source” may not have been right. The majority of documents on my grandmother give one place of birth. Two documents give a different place. However, those two are contemporary to her birth and with probable informants who had first hand knowledge. The other documents (significantly more than two) contain information given later by informants who did not have first hand knowledge and only knew what they were told. Just because the majority of sources agree does not mean that they are correct. Analysis isn’t always that simple. 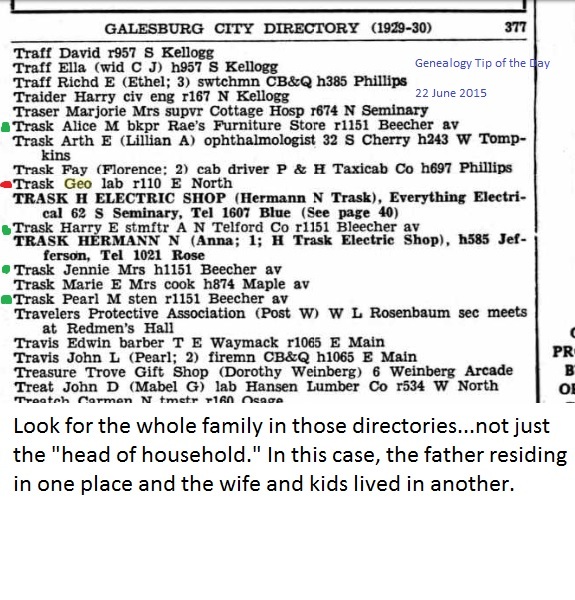 Don’t forget to look for the entire family in a city directory. In this small town the others were easy to see, but in an urban area it wouldn’t have been so obvious that the wife and children were living in a separate location.